Two industry titans. Two different strategies for success. Only one is the better buy. Apple (NASDAQ:AAPL) and Microsoft (NASDAQ:MSFT) have been battling for supremacy in the personal computer market for a long time, and both rivals can claim victories. Let's find out which stock investors should buy today. 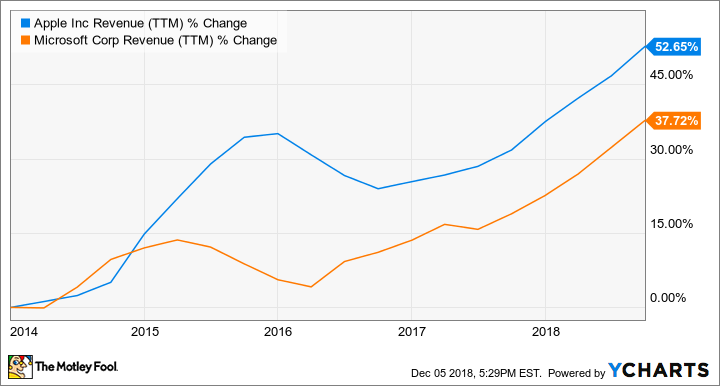 Even though both companies are expected to grow earnings at about the same rate, Microsoft deserves to trade at a higher valuation than Apple, because of the software giant's reliance on more reliable streams of revenue, such as cloud spending and subscription services. Corporations will probably continue to invest in cloud services no matter what the economy is doing. On the other hand, Apple is still mostly reliant on selling pricey gadgets to consumers who may put off upgrading their iPad or iPhone if the economy slows down. Over time, though, services could become a much bigger contributor to Apple's top line, which would make the company less dependent on hardware sales. But leaving Apple's iPhone dependency aside, there is currently a fairly large valuation gap between the two stocks. Microsoft's forward P/E of 22 looks justified relative to its underlying growth. But Apple's forward P/E of 12 looks too attractive to pass up. Apple's shares trade at a discount to the S&P 500 index's forward P/E of 16.7 -- an average of many household-name companies. Plus, at $123 billion, Apple has about twice as much net cash on its balance sheet as Microsoft, and the iPhone maker generated $64 billion in free cash flow over the past year. Apple has plenty of resources to reward shareholders through a combination of dividends and share repurchases. I don't think investors can go wrong with either stock, but I'd go with Apple at current market prices.